American firm Matt Fajkus Architecture has added a multi-level extension to a 1930s dwelling in Austin, topped with a roof that looks like a mullet haircut. 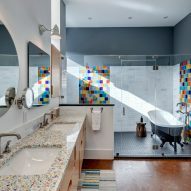 The project involved the remodel of a rundown 1938 bungalow in the city's Clarksville district. Founded in 1871 by a freed slave following the Civil War, Clarksville is considered the oldest surviving "freedomtown" west of the Mississippi River. The storied neighbourhood is listed on the National Register of Historic Places. 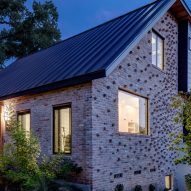 Because of the brick bungalow's history, the design team had to adhere to certain restrictions and get approval from Austin's Historic Landmark Commission. "The original house was deemed a contributing structure this historic place, and therefore could not be removed, even though it was in severe disrepair," said local studio Matt Fajkus Architecture, also known as MF Architecture. 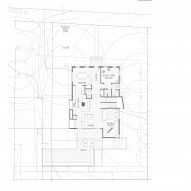 The clients, a young family, desired more space for working, entertaining and overnight guests. 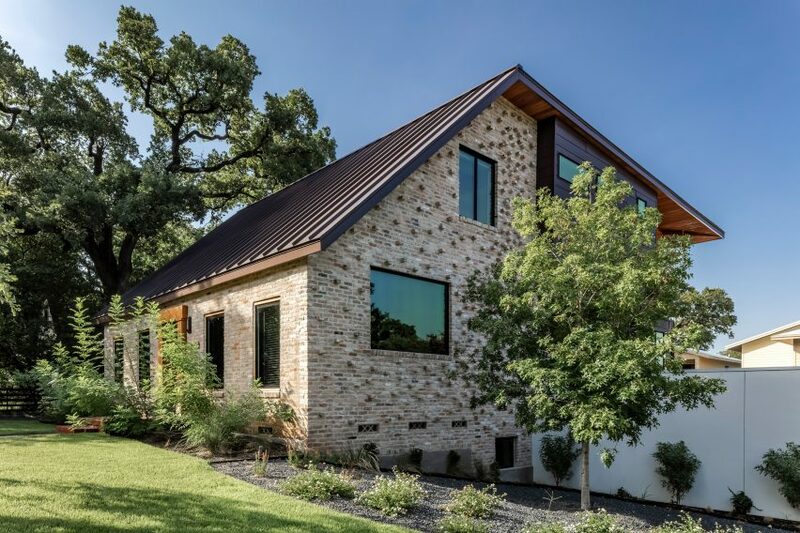 To ensure modifications to the home respected the historic context, the architects collaborated with the Old West Austin Neighborhood Association. The home sits on a grassy, quarter-acre property with a 12-foot (3.6-metre) grade change. Both the front and rear of the property connect to leafy streets. The quiet, front facade was kept intact, while the back was completely overhauled. 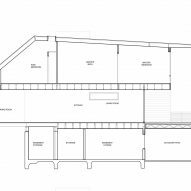 A multi-level addition features extrusions and setbacks and is wrapped in a mix of wood, metal, stucco and brick. A large portion of the extension features brick corbelling to help blend the old and new. A new metal roof encompasses the dwelling. The project's name, Mullet House, stems from the home having a modest front and a "party in the back". Its distinctive roofline is almost flat on top, then drops down steeply at the rear, similar to the mullet haircut that became popular in the 1970s and 1980s. "The design aims to preserve the character of the context with a humble front facade, while unfolding and transforming in the back to accommodate small and large social gatherings," the team said. Inside the home, the architects carefully choreographed the sequence of spaces. The entrance, which feels "humble and compressed", has dark walls and antique furnishings. 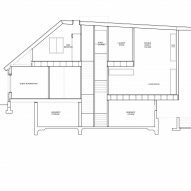 Rooms become larger and brighter as one moves toward the rear of the dwelling. "Larger spaces are accentuated with lighter colours, materials and furnishings, as well as a two-story graffiti wall – all bathed in natural light from expansive modern openings," the team said. 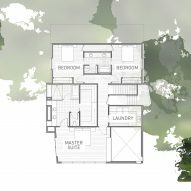 The main level contains the kitchen, dining area and living room. The public zone opens onto a generous terrace with wooden decking and metal railings. 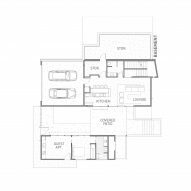 The upper level houses two bedrooms and a master suite, while the basement level contains guest quarters, a lounge, a garage and storage space. A staircase lies at the centre of the home and connects all three levels. "The end of the staircase volume breaks away from the orthogonal grid with a diagonal cant that breaks up the east facade and captures unique light and views, all while connecting the old and new," the team said. The team repurposed original material wherever possible. Original bricks were used on the exterior, and framing lumber was used as a finish material on the main level. 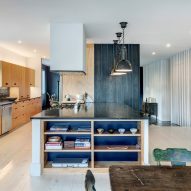 "A dead tree on the lot was milled to construct the dining table, increasing the connection of the newly designed intervention to its original surroundings," the team added. Founded in 2010, Matt Fajkus Architecture is led by Matt Fajkus, who studied architecture at Harvard University. His studio has completed a number of projects in its home state of Texas, including an addition to a mid-century home overlooking a creek, and an asymmetric house with a large garage for vintage cars.